Infrastructure projects aimed at improving the road sector, worth Rs. 6.92 lakh crore has been announced. The recent announcement has estimated building 83,677 km of roads over the next five years and ensuring employment generation of 14.2 crore days of work. 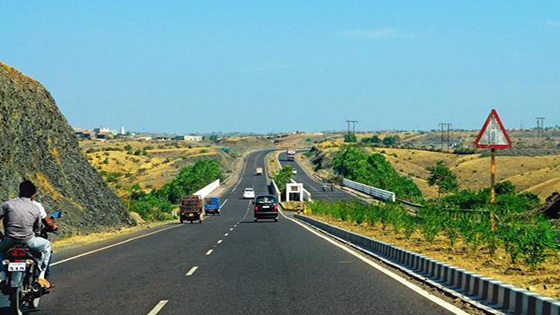 This includes the Bharatmala project that is underway, which seeks to connect India with highways stretching up to 34,800 km, at a cost of Rs 5.35 lakh crore. Under Pradhan Mantri Urja Ganga, the Oil Minister has launched supply of environment-friendly piped natural gas to 255 houses in Chandrasekharpur area in Bhubaneshwar, Odisha. With a view to developing more industries in the eastern belt, in states like Uttar Pradesh, Bihar, Jharkhand, Odisha and West Bengal, such pipelines will be built, under the Pradhan Mantri Urja Ganga project. The Ministry of Power and Textiles will collaborate under the initiative, Sustainable and Accelerated Adoption of Efficient Textile Technologies to Help Small Industries (SAATHI), to supply energy efficient power loom and other equipment to small and medium powerloom units in the country. The Energy Efficiency Services Limited (EESL) will procure energy efficient powerlooms in bulk with no upfront cost, and provide them to textile units, who will be required to repay to EESL in instalments over only a four to five year period. Workshops will be organised in clusters in Erode, Surat and Ichalkaranji to demonstrate how the scheme will benefit such units. Aiming to encourage innovation and entrepreneurship in the energy sector, new programmes have been launched in this direction. Around 10 Public Sector Undertakings operating under the Ministry of Petroleum and Natural Gas have set up a corpus of Rs 320 crore, to support such initiatives, and have selected close to 30 start-up projects to extend support to, in the first phase of the scheme. The Central Government has approved a state bank recapitalisation plan worth 2.1 trillion rupees. With a view to revive investment and clear the banks’ bad debts, recapitalisation bonds, equity insurance and some amount of budgetary support will aid in clearing off bad loans and improve credit flow. The Bay of Bengal Initiative for Multi-Sectoral Technical and Economic Cooperation, an international organisation consisting of Bangladesh, India, Myanmar, Sri Lanka, Thailand, Bhutan and Nepal, as member states, organised its first meeting to deliberate on Traditional Medicine. The meeting also witnessed discussions on the scope for technical cooperation and research collaboration among the member states in this field, in order to further promote and strengthen traditional medicinal knowledge. The first skilling centre, Pradhan Mantri Kaushal Kendra, for smart cities has been inaugurated. This is a step forward in keeping with the Centre’s emphasis on supporting skilling in smart cities. In collaboration with the New Delhi Municipal Corporation, the National Skill Development Corporation will seek to set up-skilling centres for smart cities, will provide training to unskilled youth under its Short-Term Training module and also extend support in carrying out capacity building exercises for employees of the municipal corporation. A website for the Cell for IPR Promotion and Management has been launched by the Minister of Commerce and Industry, as a step towards effectively implementing the National Intellectual Property Rights Policy. Awareness and sensitization revolving around IPR and regular updates will be displayed on the website. It will also make known initiatives taken by the government to strengthen the IPR regime in the country.